Oh man. Where do I start? 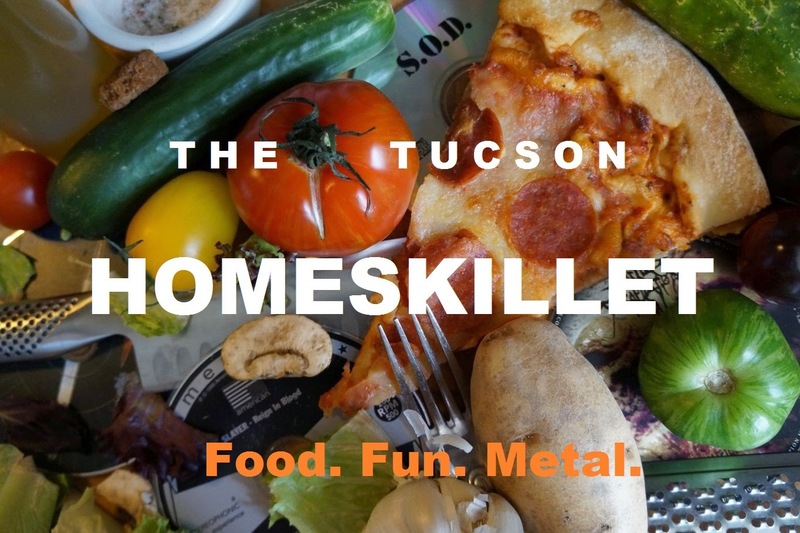 Okay, so...if you've been reading my stuff lately it seems that I have been discoursing a bit (alright, kind of a lot) about my transition from California guy to Tucson dude. Especially with food. The difference being that back in California I was a thick but lithe 170+ pounds where as since moving to the Old Pueblo I have reached the 200 and then some chunk style. Yes, the Sonoran hot dogs. Yes, the Mexican food. Yes, the sandwiches from my favorite delis. Yes...YES! The Indian fry bread taco. Indian fry bread is pretty simple. Its basically leavened bread made with milk, water, salt, flour and baking powder then deep fried. The first time I had it was at the 4th Avenue street fair like the second or third year since moving here. It was good. You know, just another version of a tortilla or naan. But I didn't really pay close attention to the fry bread until I had it in taco form. Now imagine this: Your usual taco fillings sitting on top or jammed into of a fluffy flattened near donut pastry. Sounds amazing right? Well that's because it is! So when we got word that a little place out in the Barrio Hollywood nook was serving up some of the best Indian tacos in town, we had to see for ourselves if it lived up to the hype. Sitting right on the corner of St. Mary's and Grande Ave. is a fairly inconspicuous and diminutive food stand calling themselves Manna From Heaven. Having been open for a little more than a year, they have already gathered quite the following for their fry bread tacos, quickly became the darling of a local weekly periodical because of them and their average online ratings are easily in the 5 star range. Impressive. For real, Manna From Heaven is right in the thick of it. Traffic, bustle and the normal goings on in that neck of the 'hood surround the boutique-sized grub hut. The interior is pretty stripped down and, shall we say, cozy, with a few tables and chairs scattered about. A hand-written dry erase board menu rests behind the register and under a flat screen TV, which on this day it was beaming presidential hopeful Ted Cruz and him doing some kind of rally speech or...whatever. A lady in a bright red t-shirt welcomed us and asked what we wanted. Pretty much one of each, is what we said. Luckily this was on a Wednesday so they had a fry bread taco lunch special going on. We got the green chili, red chili and regular taco (which is seasoned ground beef) plus three sodas and the whole thing came to less than $20. She also assured us that the tacos were pretty big and hoped that we brought our appetite. Since the inside space was fairly cramped for the three of us, along with that Ted Cruz dude screaming about...who knows, we opted for the patio which turns out to be everyone else's go to option as far as the internets were concerned. You have to remember, Manna From Heaven is in the thick of the barrio, so buses stop right there, beeping and blast hissing as they lower themselves to let handicapped riders off. Cars zoom by, most with booming bass lines vibrating the foundation. Or the occasional squabble between two star crossed lovers pushing jam packed shopping carts fill the otherwise tranquil air. 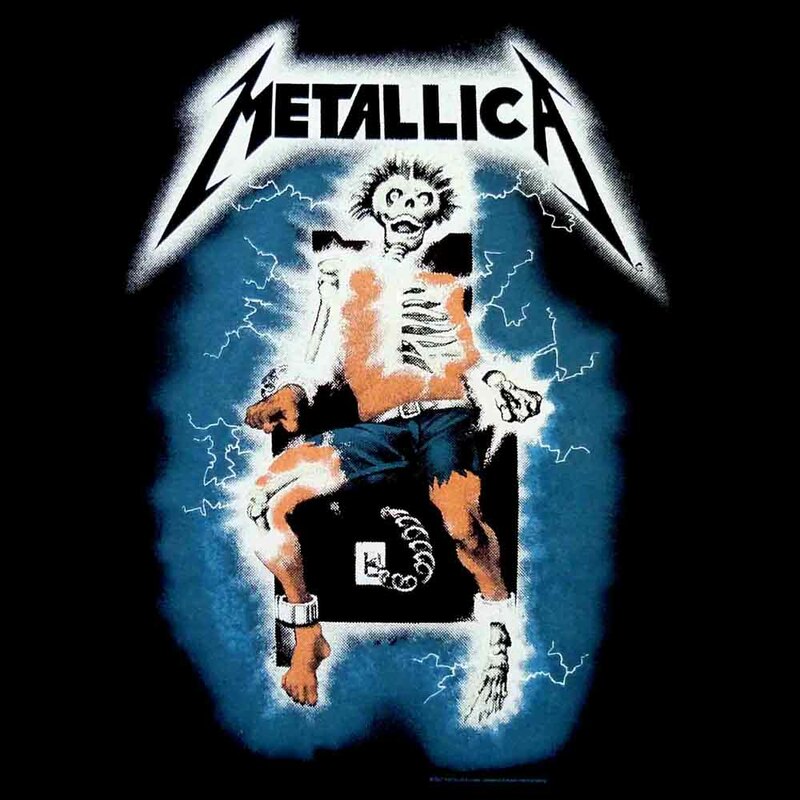 The best part was this one guy who was sitting near the patio area, talking to himself and listening to Metallica's "Ride The Lightning" on a broke down transistor radio. As we sipped our sodas and waited for the food to arrive, the opening strains of 'Fade To Black' flitted along with the other forms of cacophony of the area. To be quite honest with you, it was all so very perfect. But then soon enough the tacos arrived and the world grew a little less frantic. In fact, I think we heard angels sing. The lady at the register wasn't kidding when she asked if we brought our appetites. These Indian fry bread tacos were big. Like medium pizza size big. Each one was loaded with meat, beans, cheese, lettuce and tomatoes. They looked incredible and smelled fantastic. So without wasting anymore time, we started cutting up bits of the tacos to survey the flavors of each one. Yep, you heard right: You pretty much need a knife and fork to take one of these suckers down. Picking one up is like trying to wrestle a small puffy meat filled bear to your face. Plus it was all about sharing so we divvied up the goodness and went for it. First off, the fry bread is dead on. Light and airy but with a good heft; flavorful, not too greasy or chewy. So we knew we were in good hands just from the strata. The beans were hearty and creamy with a good bite and lots of flavor. The green chili chicken was amazing. Lots of spice and really good texture. Red chili did not disappoint either. Rich and tasty with a distinct kick. The 'taco meat' option was also on point. The lettuce was crispy and fresh, the tomatoes as well. You put all of these components together and what you have is a weighty delectable treat that is easily split between friends. Manna From Heaven? I couldn't say it better myself. "We get here everyday at 8 am to start prepping," said Rebecca, our server and the nice lady at the register, "so by 11 when we open everything is ready to go. "Everything here is home made and served fresh. We make the beans everyday, cook and marinate the meat fresh everyday. The fry bread is home made too and because we have only one pan to fry them in sometimes it might take a while to get your taco if we're busy. "We're really glad people seem to like our food because we love making it and making people happy." Here's the thing: we all showed up hungry and we are all big eaters. I'd say about halfway through our fry bread taco extravaganza, we began to show signs of wearing down. These tacos are for real. For the $7 or so you shell out for one, you basically can feed two people. But we didn't want it to end! The more we ate the more the elements melded together and just became a monumental flourish of bean/meat/cheese/veggie ratio. The fry bread began to soak up the seeping grandeur from the meat and beans, the cheese and veggies began to harmonize with one another, the spices fused and just became one unit of awesome all the while that dude with the crappy radio kept listening to 1980's era Metallica. Unreal. Actually very real, but so good. See, if you keep what you do to a pinpoint simplicity, what you are then offering the world is a well honed and composed product that nobody else can contend with. The good folks at Manna From Heaven, that's what they have going on. Stripped down yet each item is made with so much care and attention. This mini mart corner shop of fry bread magnificence deserves your attention and above all your insatiable hunger. Because believe the three of us that tried to take down the triple taco trial of terrific taste, we basically met our match but were oh too happy to be pinned by the abundant stature of each one. That's when Rebecca brought out a dessert fry bread. Even as packed in that we were, of course we had to eat some of the goods here. Hot, thick and drizzled with local honey and sweet powdered sugar, this final piece of the flavor puzzle just threw us over the edge. It was nap time. Or at least time for a digestive whiskey or something. In fact, it was time for both. To sum up, Manna From Heaven is divine. In such a small space they are able to create some of the best Indian fry bread taco creations I have ever had the privilege to eat. 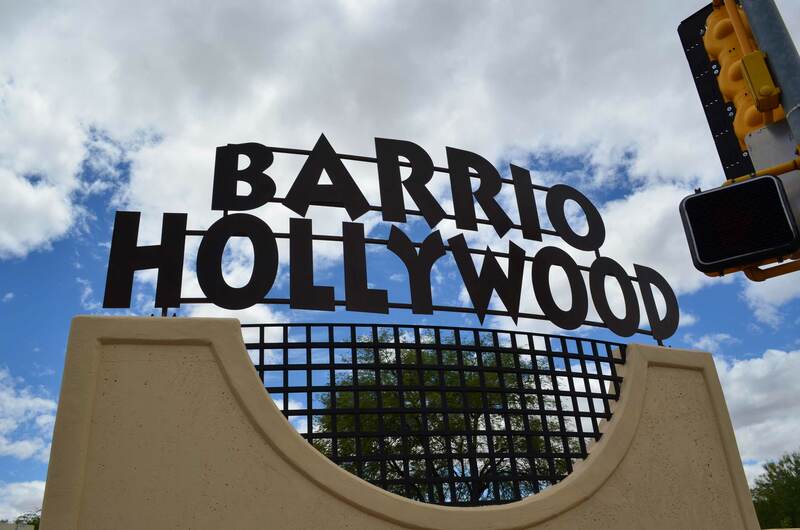 If you're in the Barrio Hollywood area, you need to get in there like today. If you're not even close to that section of town...you need to plan a day trip and make a time of it. The food, the patio, the service, experience of it all, it'll be worth the long bus ride to get there. And the bus stops right in front of Manna From Heaven! Just be sure to bring your portable hand radio and some old school Metal because that was what made the eating excursion that much more, uh, 'entertaining' for us that day. 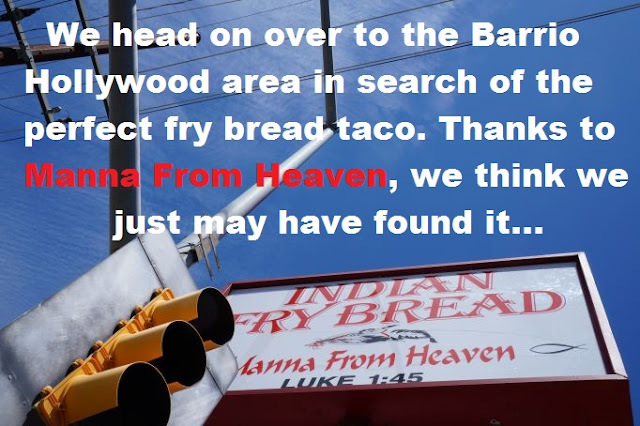 Now go forth and get yon fry bread tacos courtesy of Manna From Heaven. I want to try this next time I am in Tucson!!! Hope this place turns out good. It’s great that this venue offers services such as catering, lighting, tables and chairs, table linen and parking. I am here to choose Chicago venues for my event, glad to know that they do not put any restrictions regarding music played.